How is it that you started playing music? We all had an interest in music from our childhoods. From banging on pots and pans as a child, to getting your first drum set or guitar, it’s just something that came naturally. Have you had other previous members? There are a few live and session musicians we have worked with over the years. Mert Basturk(guitar), Onur Tuncelli(guitar), Brent Westmoreland(drums/bass), Dave de Sylva(drums). Honorable mention goes to Derek Bryson (from Slitsoul) who helped write the first album, playing the drums and recording guitar solos on the first demo. Did you make music even when you were young? All of us started playing in bands as teenagers. 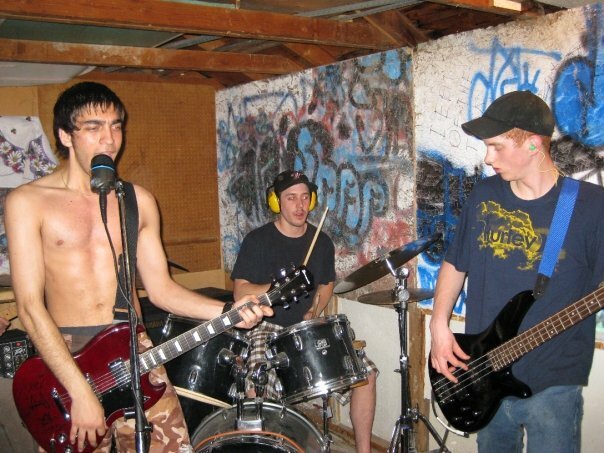 We all had high school bands. What year did the band form? Toxic Valve officially played its first show January 2009. What inspires you? The inspiration behind Toxic Valve is the toxic things in life. Anger, hatred, sadness. How often and where do you rehearse? We jam in Nathan’s basement. We only practice before shows, and we usually only play one show a year. How have you developed since you started with the music? The songs we wrote ten years ago were simpler and more aggressive. The newer songs are more complex. 2 minute songs turned into 5 minute songs. Do you have other interests of work outside the band? No. Our jobs are only so we can stay alive. We hate them. Are you looking for a booking agency, and what are your thoughts around that? We haven’t really looked for a booking agency. Nathan does all our bookings. Punk music should be DIY, do it yourself. It’s always been that way. Are you looking for a label, and what are your thoughts around that? Labels can help pop stars get famous, but when you’re a small band they take your money from merch sales. What made you decide to make this music? No one made a decision to play a style. It’s just what comes out when you pick up your instrument. The lyrical content of the songs has covered relationships, hating your friends, alcohol, murder. Who does the composing and writes the lyrics? Nathan writes all the lyrics but the music is collaborative. Do you start with the music or the lyrics? 90 % of the songs start as music first. Do you compose in a certain environment? Try to limit your audience when writing. One or two people only. Have you done any covers live? We have played Nine Inch Nails, ACDC, Judas Priest and Eric Clapton covers live. What language do you sing in? We sing in English only. Years ago, one of Nathan’s bands wrote a few songs in Okanagan Native language (Canadian Aborigine). What are the least and most people to attend one of your gigs? We have played a show to 5 people and a show to 50 people. Sometimes we scare your mom and her friends. What ages are most of your concert attendants? Everyone is usually 25 to 35 years old. Do you always play the same songs live, or do you vary? The set hasn’t changed much in ten years. People want to hear what they want to hear. Do you have a regular place you play live often? We don’t play very often. Like 6 shows total. What was your first gig like? We played as loud and as angry as possible. The band after us played mellow polished soft rock. It was disgusting. What was your latest gig? We played the Blood Brothers festival. People were shocked by the sax player. Sax doesn’t go with punk or metal. Have you had to cancel a gig? No. We never cancel. EVER. Where have you played live this year? We played at The Doors Pub in November. It’s a metal bar known for its amazing tacos. Where do you plan to gig the coming year? We have our tenth anniversary show coming up this weekend (Jan 19th) and one show April 4th with Italian touring band NEKER. When did you start to sell merchandise, and what do you have for sale? We don’t sell merch. Where can people buy your merchandise? Come to a show instead of buying merch. Yell at us. Get in the mosh pit. What do you think about people downloading music instead of buying records now a days? Go ahead and download. But we don’t believe in Ipods, Iphones or Itunes. Boycott!! How do you think the music industry has changed because of this? No bands can make money on albums except local bands. So you have ancient dinosaur washed up bands going on tour into their 70’s. Sometimes grandpa sings well, most times not so much. What do you think of my work? It’s great you are promoting new music. There should be more people like you. How do you think and know that this interview will help you in the music business? If even one person checks out our music after reading this then we are happy from that. Do you have any role models or idols? We like Billy Idol. Why do you think that they exist? Billy Idol is god. Who are we to disagree. Is it easier to find inspiration from older bands, or bands that are more active today? Everyone loathes modern bands. There is something that can be learned from that. Maybe people don’t like change. Maybe people like predictable music. I don’t know – do you know? What have been your biggest obstacles? It seems that people let little things get in the way of their abilities. Whether it’s their wives, jobs or personal problems, all that stuff gets in the way. Those people that stay home and say they have all these problems ARE the problem. Get a life. No one cares about your cat, Sean. What advice would you give other bands or artists? Stick with it. Even if it costs you everything. Sell your mom if you have to. How do you get psyched for a gig? Rehearsal gets us pumped. Yell into the mic. Tell everyone the things you were scared to say. Tell em real loud. Do you have any new material? All the new songs won’t be shared with anyone until they are at least 5 years old. There is a process. How can people reach you? Message us on our facebooks. We respond quickly. Feel free to reach out to the members. We are “nice”. Just search Toxic Valve. There’s only one. What are your plans for the future? We would like to make this band a five piece with ripping solos. Record more songs.